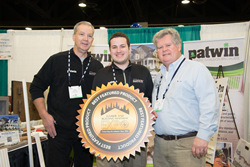 Patwin Plastics reinforced PVC extrusions has been voted the Best Featured Product by LBM Expo attendees. The Northeastern Retail Lumber Association (NRLA) is excited to announce Patwin Plastics reinforced PVC extrusions has been named the Best Featured Product at LBM Expo ’18 which took place at the Rhode Island Convention Center in Providence, R.I. from Feb. 14-16, 2018. The Best Featured Product award was voted on by LBM Expo attendees. Patwin Plastics (Linden, N.J.) recently announced a breakthrough in PVC extrusions. Using Proprietary technology and glass fiber reinforcement, Patwin offers a product that is up to 500% stiffer than conventional PVC extrusions. Awarded Best Featured Product at LBM Expo ’18, Patwin’s reinforced PVC extrusions have superior thermal qualities and reduced expansion/contraction. These new extrusions have a myriad of applications from door frames and mull posts, to railings and pergolas. For more information on Patwin Plastics visit http://www.patwin.com. LBM Expo is the largest regional gathering of LBM retailers in the country. For 124 years, LBM Expo has connected retailers with education, networking and products from world-class manufactures, distributors, and wholesalers. Produced annually by the Northeastern Retail Lumber Association (NRLA), LBM Expo will host the 125th Annual LBM Expo in Providence, R.I. Feb. 6-8, 2019. For more information visit LBMExpo.com.